Things used to be tricky for cash strapped musicians looking to lay down some basic tracks in the pre-digital age. With the industry standard Revox A77 open reel tape recorder being the exclusive plaything of the well heeled, even the cheaper Akai GX-77 reel to reel was out of reach for musicians accustomed to their weekly Giros. Out of desperation often comes innovation, and musicians cooked up ways to 'bounce' mixed down tracks between two cassette recorders, effectively achieving cut-price multi track recording at the expense of sound quality (and a pile of hiss). 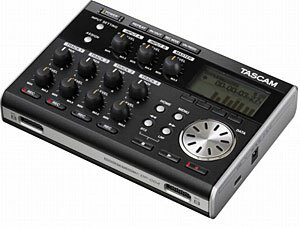 The TASCAM Portastudio changed everything, offering 4 track recording and mixing in a compact package. Debuting in 1979, the quality was good enough for Bruce Springsteen to record his Nebraska album entirely on a Portastudio 144. 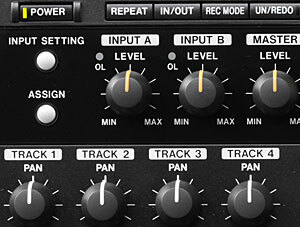 Although handy and substantially cheaper than a reel to reel and mixer combo, Portastudios were still out of the reach of many struggling musicians, and it wasn't until the digital age that multi track recorders became truly affordable, with compact units offering built-in multi-effects processors, hard drives, chromatic tuners, USB and even CD burners. 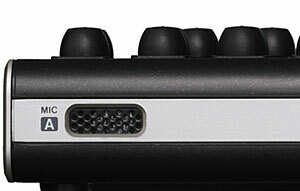 Tascam have continued to be major players in this market (their current TASCAM DP-02 8-track 16-bit/44.1kHz Portastudio is an absolute gem), and the company also offers a range of ultra-compact recorders, letting musicians slap down some tunes wherever the inspiration strikes. We were impressed with the Tascam's GT-R1 portable guitar/bass recorder we looked at it August, and the company has just announced a new portable digital studio, the DP-004. Available from November 20th in Japan for around $200, this bijou 4-track recorder features two mic/line inputs, 4 track recording at uncompressed 44.1k/16-bit audio quality, independent pan/volume controls, 3.5mm stereo mini- phone jack, an USB 2.0 port and SD/SDHC card slot offering up to 32GB storage. There's two mics on the front of the unit, and guitars can be hooked up directly to the mixer with a built-in metronome to keep loose/drunk musicians from wandering off the beat. 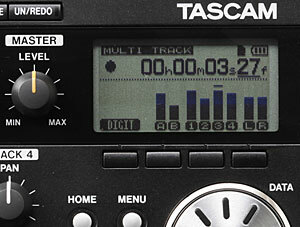 Tracks can be exported and imported as WAV files, with Tascam claiming a battery life of around eight hours.